From early on in the planning of Disneyland, Walt Disney envisioned a monorail in Tomorrowland. Walt and Disney park designers were not impressed with several suspended systems they looked at. Legend has it that he and Mrs. Disney happened across the Alweg test facility in Germany by accident and monorail history was made. Disney designers modified the Alweg system and installed a smaller-scale Alweg monorail in 1959. At the time it was the park's most popular and talked about attraction. Millions of TV viewers saw the monorail on Walt's Sunday show and became convinced of its future in transit. In 1961 an extension was added to connect to the nearby Disneyland Hotel. While Disney installed the monorail to promote it as a train of the future, the effect it had was just the opposite. 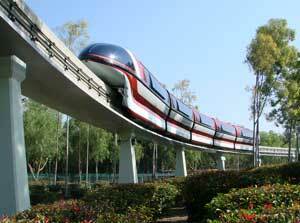 Monorails for many years would be type-cast as amusement park rides. Then there are the believers who remember Walt's early TV shows and still dream of beamways running down major transit corridors in the USA. Train designs have been designated Mark I, Mark II, Mark III, Mark V and Mark VII (Mark IVs and Mark VIs were for Walt Disney World in Florida).